Finding a suitable location for the RP-AC52 is vital due to the method in which range extenders work. If the incoming signal is poor, say sub-10Mbps, then the extended outgoing signal will be twice as poor, 5Mbps, due to it sending and receiving packets. Therefore it makes sense to find a location where the signal is strong, but also close to the edge of your router’s coverage zone. 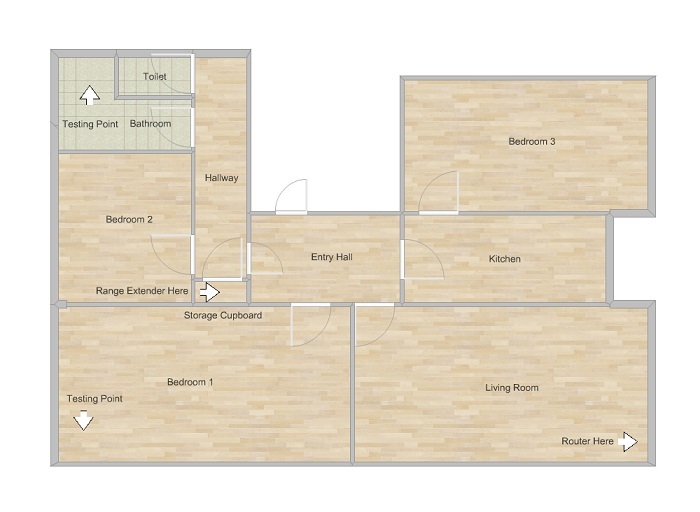 In our testing scenario, detailed in the floor plan below, the router is in an awkward location due to the BT socket placement at the front of the property. As a result the WiFi signal towards the back of the property, in bedroom two and the bathrooms, tends to suffer. To simulate a scenario where you would need to extend the WiFi signal to a deadspot in a property we tested at the location with the poorest signal, which just so happened to be the bathroom. An additional testing location with good WiFi coverage was also used for reference, bedroom one. We tested the Asus RP-AC52 range extender within our high-spec AC network powered by the latest Asus DSL-AC68U router and a laptop receiving its signal via the Asus USB-AC56 adapter. To assess the difference the RP-AC52 range extender made we ran tests from the two assigned testing points with, and without, the range extender. Speedtest.net was used to determine Internet download and upload speeds as well as ping latency. LAN Speed Test was used to determine the read and write performance to another network-connected PC’s storage. The target PC was a Gigabit-capable test system connected to the Asus DSL-AC68U router via a Cat 6 Ethernet cable.